We make eating good food a habit for all. Our food is joyful, colourful and vibrant, using seasonal ingredients that work together to provide powerful nutritional benefits. EAT HAPPY. ADRIA Founder & Chef I am Canadian born and raised, but I have worked and traveled around the world. I’ve always had an insatiable hunger for cooking (and eating) so I left the corporate world and studied at Le Cordon Bleu in London and the College of Naturopathic Medicine. Now I spend all my days being around food and I have never been happier! I look forward to meeting you at maple&CO. CSILLA Head of Ops I hail from Hungary but have fallen in love with London after moving here eight years ago to study Psychology. I am honestly however an operations geek at heart and creating happy teams and customers makes me tick! 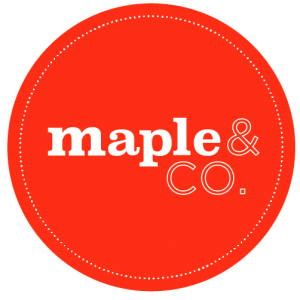 I joined maple&CO at it’s three store mark and I cannot wait to see what’s next. VALENTINA Assistant Operations Manager I’m an Italian sports-addict, food and dog lover who moved to London over 5 years ago. I’ve worked in hospitality for long enough to know that I’m truly passionate about what I do and customers are my top priority. I’m glad to be part of the maple&CO family love seeing the team grow! ISAC Head Chef Born in Brazil, I’ve always been passionate about food. Living with my mother, the chef, cooking for me has always been a hobby and a way to relax. When I moved to London what started as a hobby became my career. While experimenting with different types of cuisines and discovering new flavours I’ve also become a Nutritional Advisor. I am very excited to be part of Maple&CO, where I will be able to be creative in the kitchen. ROBERTO Finance Since I was a kid I’ve been passionate about numbers, neatness and order which lead me to achieve a Degree in Economics. I joined Maple’s family and started as a counter service team member and have worked by way up (with inexhaustible grit) to manage the finances. I’m proud to be a live testimony of rapid career growth opportunities at Maple.